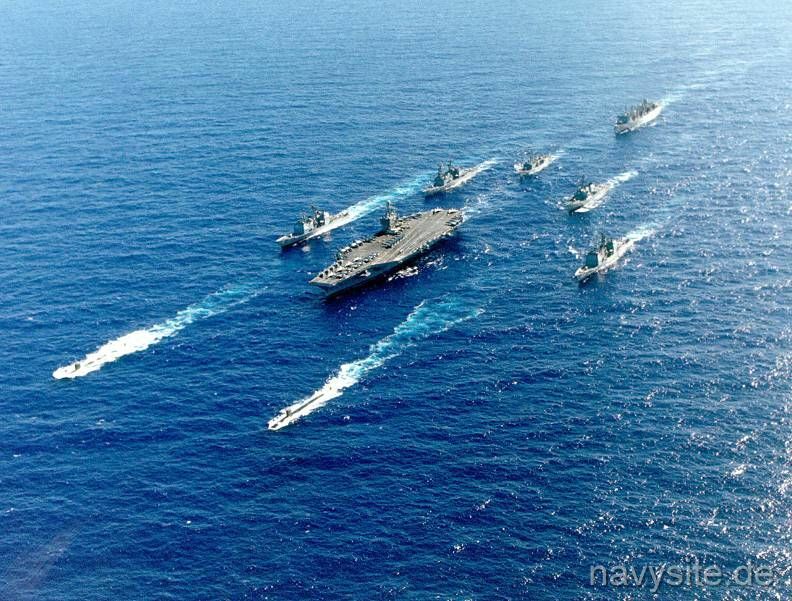 June 20, 2000 - USS Abraham Lincoln (CVN 72) leads a formation of US warships during RIMPAC 2000. July 12, 1996 - USS Enterprise (CVN 65) and USS George Washington (CVN 73); the fast combat support ship USS Supply (AOE 6) and the ammunition ship USS Mount Baker (AE 34) steam in formation in the waters of the western Mediterranean Sea during turnover operations. 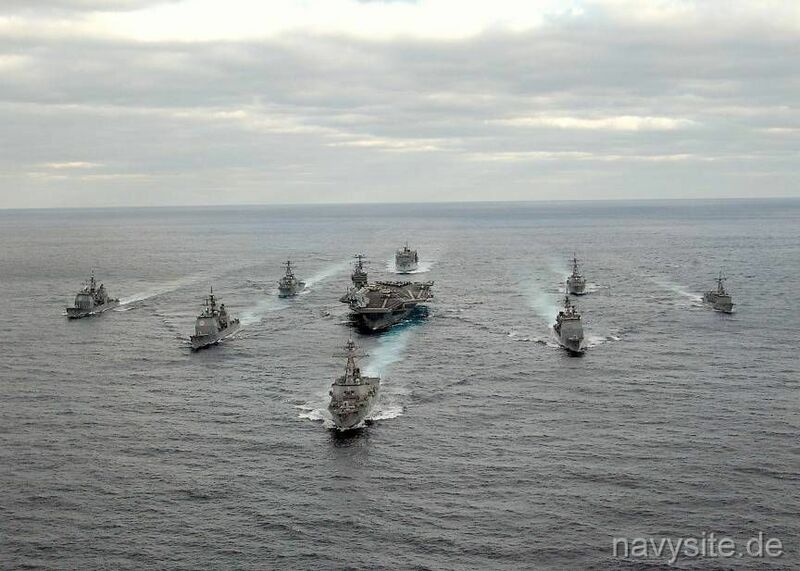 The Enterprise Battle Group relieved the Washington Battle Group in the Mediterranean Sea. February 6, 2001 - US Surface Combatants during a coordinated engagement capability (CEC) excercise off the coast of Florida. The ships are (from left): USS Vicksburg (CG 69), USS Anzio (CG 68), USS Cape St. George (CG 71), USS The Sullivans (DDG 68), USS Carney (DDG 64) and USS Hue City (CG 66). USS Missouri (BB 63) Battleship Battle Group (BB 63 not visible). 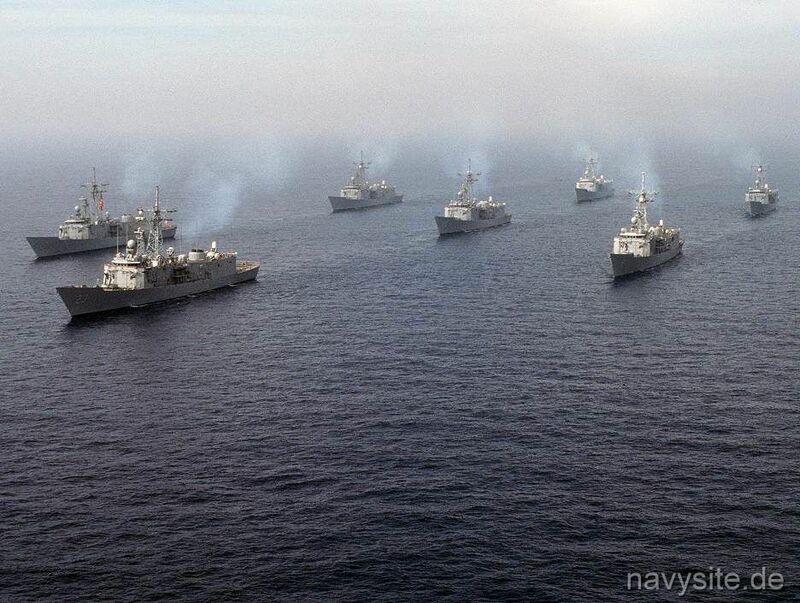 September 24, 2001 - USS John Paul Jones (DDG 53) leads a formation of ships in a series of close ship maneuvers. 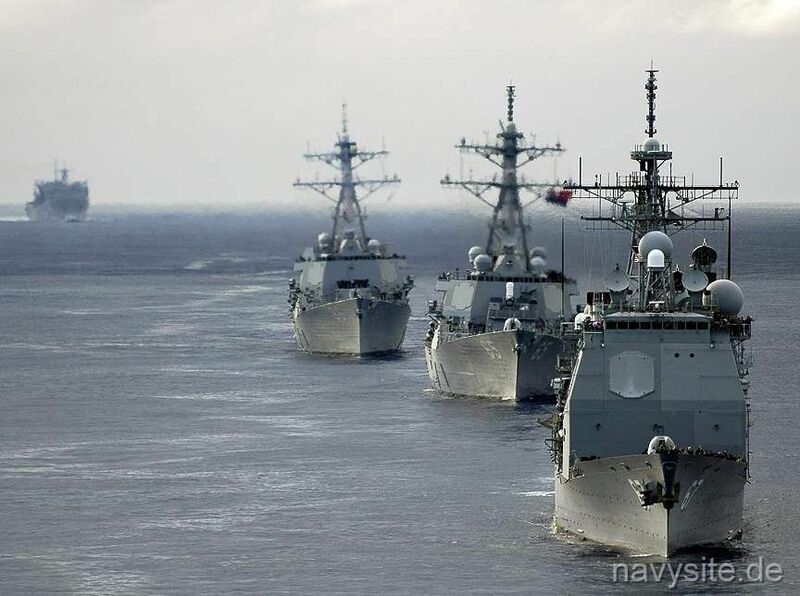 With John Paul Jones are USS Nicholson (DD 982), USS Philippine Sea (CG 58) and USS O'Brien (DD 975). 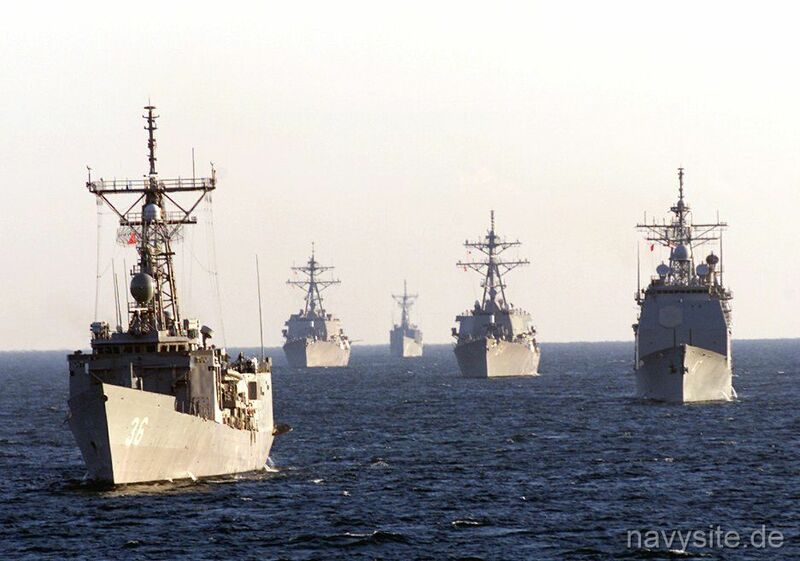 January 18, 2002 - USS Underwood (FFG 36), USS Ticonderoga (CG 47), USS Carney (DDG 64), USS Winston Churchill (DDG 81), and USS Taylor (FFG 50) steam in a "Ships Parade" formation during Joint Task Force Exercise (JTFEX) 2002. 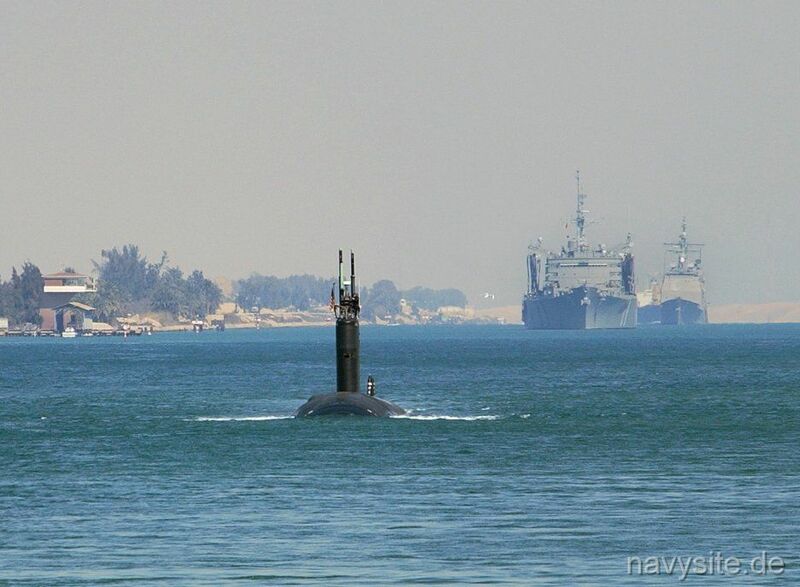 March 4, 2002 - USS Hue City (CG 66), USS Seattle (AOE 3) and USS Boise (SSN 764) transiting the Suez Canal. August 16, 2002 - Carrier Air Wing Seven (CVW-7) performs a fly over in formation along with USS John F. Kennedy (CV 67), USS Hue City (CG 66), USS Vicksburg (CG 69) and USS The Sullivans (DDG 68) to conclude an air show performance for over 1400 "Tigers" aboard the aircraft carrier. 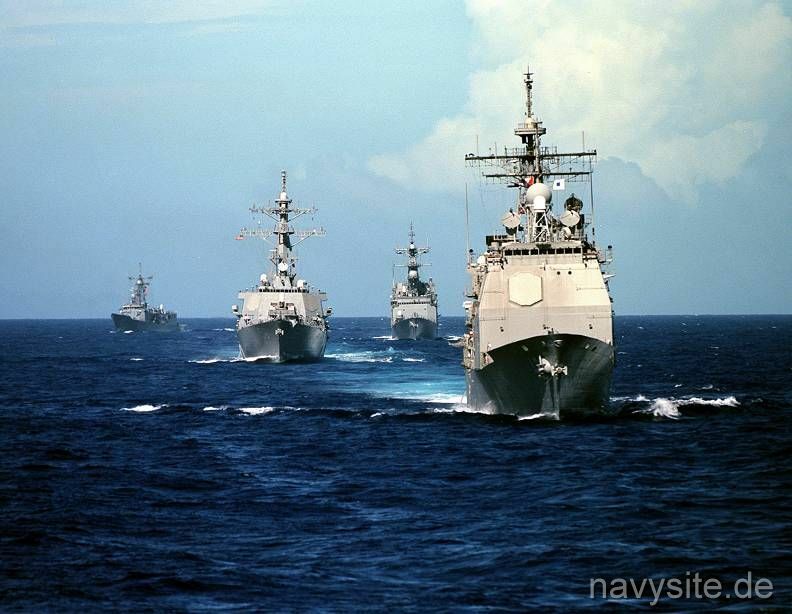 September 18, 1999 - USS Vincennes (CG 49) (right) steams in front of three other classes of U.S. Navy ships as they operate in the Pacific Ocean during a Y2K operational testing exercise. Following the Vincennes from right to left are the USS Cushing (DD 985), USS John S. McCain (DDG 56), and the USS Gary (FFG 51). 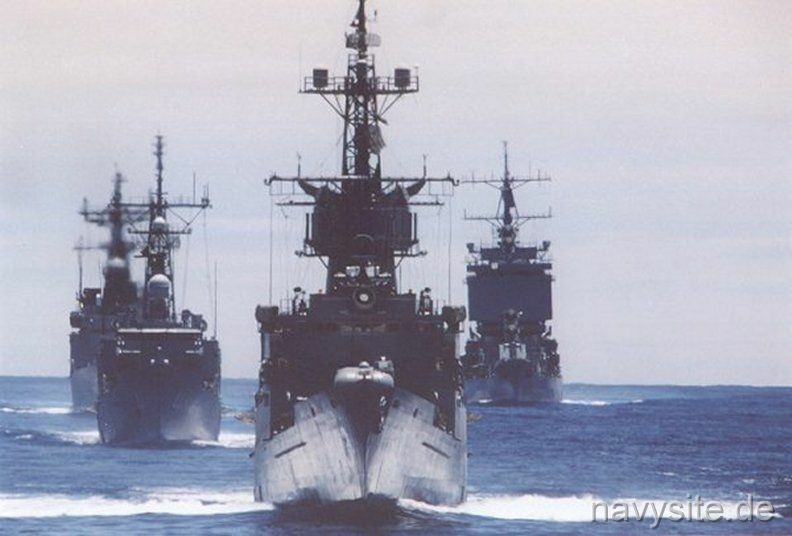 June 20, 2000 - Off the coast of Hawaii, the Abraham Lincoln Battle Group steams alongside one another for a Battle Group Photo during RIMPAC 2000. Ships involved are USS Cheyenne (SSN 773), USS Tucson (SSN 770), USS Abraham Lincoln (CVN 72), USS Shiloh (CG 67), USS Bunker Hill (CG 52), USS Fletcher (DD 992), USS Paul Hamilton (DDG 60), USS Crommelin (FFG 37) and USS Camden (AOE 2). November 30, 2003 - The USS George Washington (CVN 73) Battle Group steaming together off the US east coast. 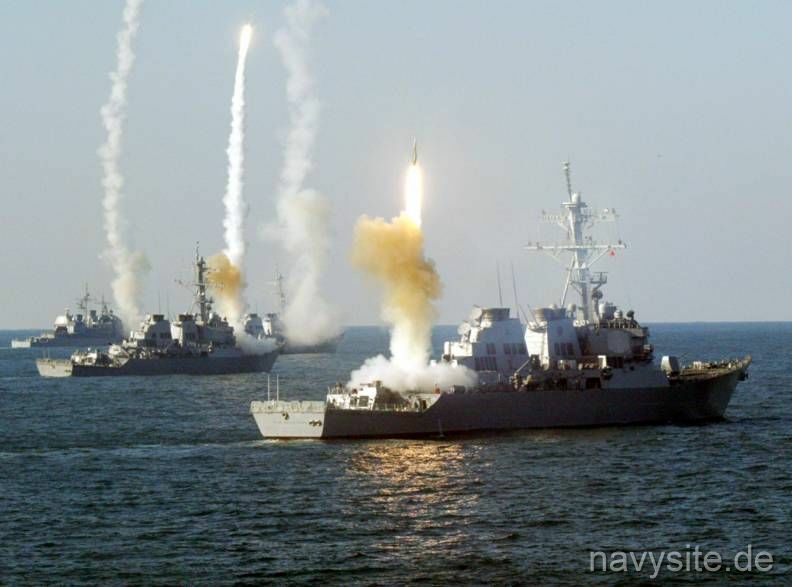 Dec. 2003 - Left to right, the guided missile cruiser USS Vicksburg (CG 69), and the guided missile destroyers USS Roosevelt (DDG 80), USS Carney (DDG 64) and USS The Sullivans (DDG 68) launch a coordinated volley of missiles during a Vandel Exercise (VANDALEX). The exercise is designed to intercept hostile missiles with the ship's missiles. Remote-controlled drones are used to simulate the hostile missiles. USNS Leroy Grumman (T-AO 195) refuels the USS George Washington (CVN 73) and the USS Normandy (CG 60). The ships in the background are the USNS Supply (T-AOE 6) and the USNS Saturn (T-AFS 10). 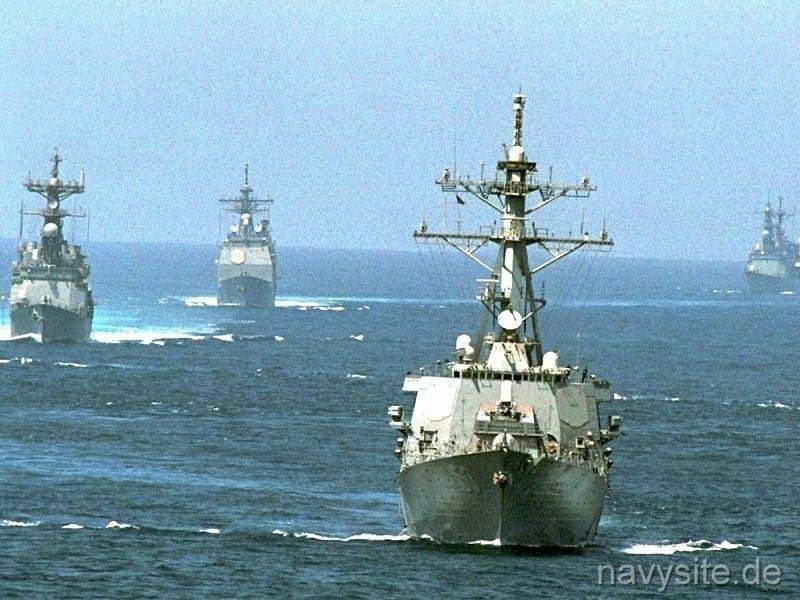 March 5, 2005 - The guided missile destroyer USS Porter (DDG 78), right, participates in a pass in review formation during divisional tactics training in the Atlantic Ocean along with the guided missile destroyers USS McFaul (DDG 74), USS Arleigh Burke (DDG 51) and USS Cole (DDG 67), and the guided missile cruisers USS Cape St. George (CG 71) and USS Anzio (CG 68). 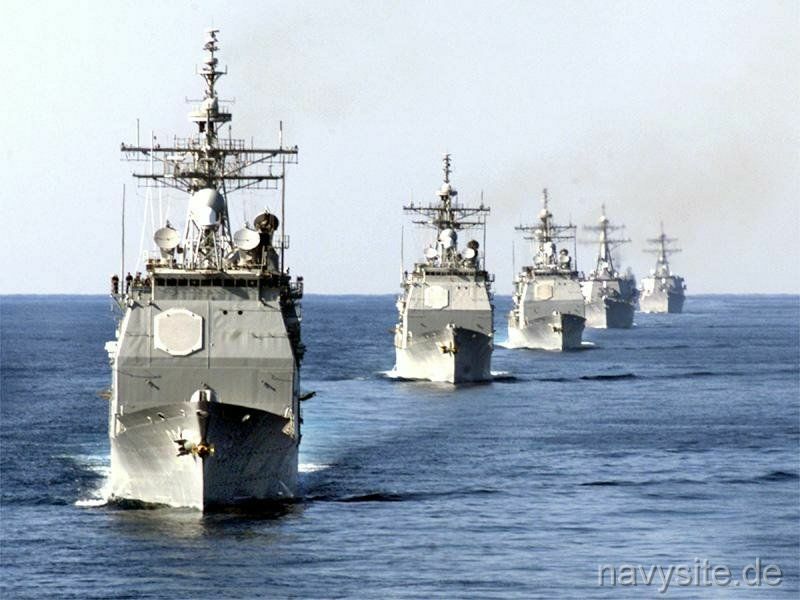 Feb. 25, 2005 - The ships of Commander Destroyer Squadron Nine (CDS-9) (USS Shiloh (CG 67), USS Benfold (DDG 65), USS Shoup (DDG 86), and USNS Rainier (T-AOE7) steam behind the USS Abraham Lincoln (CVN 72) as part of events that took place for a "Tiger Cruise." 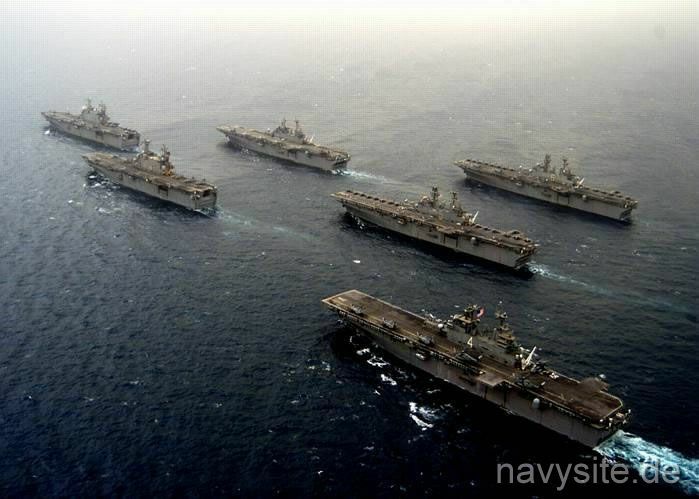 April 20, 2003 - Six amphibious assault ships are steaming together in the Persian Gulf. They were deployed to the area as part of the build-up of forces in support of Operation Iraqi Freedom. 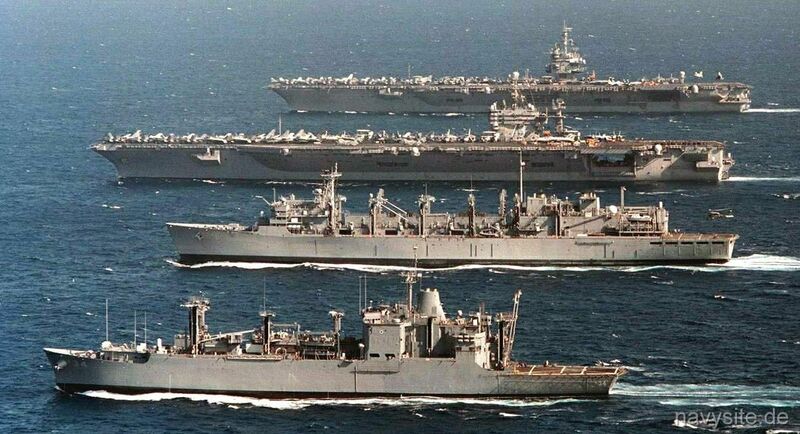 Visible are (from left to right): two Tarawa - class LHAs (the second one is most likely the Nassau (LHA 4), USS Kearsarge (LHD 3), USS Bataan (LHD 5) [center], USS Boxer (LHD 4) and the USS Bonhomme Richard (LHD 6). January 23, 1994 - Destroyer Squadron One steams off San Clemente Island. Visible are from left to right, rear to front; left row (rear) USS Sides (FFG 14), (front) USS Mahlon S. Tisdale (FFG 27), middle row (rear) USS Duncan (FFG 10), (center) USS Copeland (FFG 25), (lead ship) USS Lewis B. Puller (FFG 23), right row (rear) USS George Philip (FFG 12) and (front) USS Wadsworth (FFG 9).